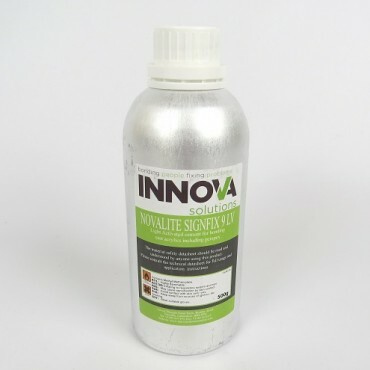 NovaLite SignFix 9LV is a single component low viscosity light activated structural acrylic adhesive designed to bond cast acrylic sheet with a bond strength that should always outperform the substrate. This ultra high strength is achieved by using a bespoke blend of advanced acrylic polymers that will cure on demand when exposed to visible light. A safer to use structural adhesive. Surface preparation: Thoroughly clean the surfaces you intend to bond with NovaBond Surface Cleaner using a clean, lint-free cloth. Follow the instructions and allow time for the solvent to ‘flash off’ (evaporate). Apply direct from a 250ml squeezable bottle using the fine nozzle attached. When squeezing the bottle, exert a gentle, consistent pressure to prevent air bubbles forming within the laminating adhesive. Cover approximately 50% of the surface area using a slow, consistent motion. Draw the pool of adhesive out to the edges of the surface area ensuring the entire surface is covered. It’s better to over-apply the adhesive than under-apply and leave air bubbles to appear once the top surface is added. Float the top surface onto the laminating adhesive and apply moderate pressure. Don’t worry about any excess adhesive leaking out – it’s the only way to guarantee complete elimination of air bubbles. Take care not to exert too much pressure – the force could squeeze adhesive out and allow air in. Ideally, use a lightbox to avoid any risk in moving the pieces. The adhesive will cure in seconds, taking slightly longer on thicker materials or coloured or frosted finishes. As the cure rate depends upon lamp intensity, distance from light source, depth of cure needed, bondline gap, and the light transmittance through the substrate itself, it is always advisable to test and assess cure speed prior to production. For guidance, if the gel time under UV exposure = X always allow a minimum of X+2X for a full cure before moving the parts. Once the adhesive has cured, clean any excess with NovaBond Surface Cleaner or trim with a knife and peel off. Link to our video demonstration or review the sequence shown below…..
Cover approximately 50% of the surface area using a slow, consistent motion. Draw the pool of adhesive out to the edges of the surface area ensuring the entire surface is covered. It’s better to over-apply the adhesive than under-apply and leave air bubbles to appear once the top surface is added. Float the top surface onto the laminating adhesive and apply moderate pressure. Don’t worry about any excess adhesive leaking out – it’s the only way to guarantee complete elimination of air bubbles. Expose the transparent surface to white light (natural or artificial) or UV light. Ideally, use a lightbox to avoid any risk in moving the pieces. The adhesive will cure in seconds, taking slightly longer on thicker materials or coloured or frosted finishes. NovaLite SignFix 9LV should be stored unopened in a cool dry location, out of direct sunlight. Stored correctly this grade can offer a 12 month shelf life from manufacture. 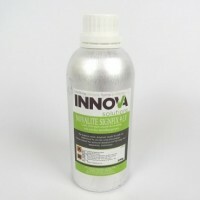 NovaLite SignFix 9LV is a methyl methacrylate and should not be used without consulting the MSDS (download available on this page), which contains full information regarding the use of this product, including Transport, Disposal, Toxicological, Exposure Controls, Accidental Release and First Aid measures essential to the safe use of this product.